My Tales from Corny Cove novelette series is based on a holiday site on the beautiful English coastline and one idea I had was to feature a character with a VW campervan who annoyed Henry, the site owner, by driving super-slow and sputtering out black fumes, etc. It would later turn out that the guy was a TV celebrity visiting the site to film a campervan & bushcraft show. I never used that idea in the series, but the character later evolved to become the Campervan Bushman, Scott Chevalier, who I like to describe as part campervan-surfer, part Crocodile Dundee. You know a bit about Scott already, but you may be surprised to know that, although I describe him as part campervan-surfer, part Crocodile Dundee, I never actually set out to mould Scott on Dundee at all. 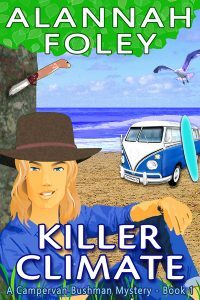 I was looking for a way to convey his character to readers trying to get a handle on him, and realised that his bush skills and sense of humour are in that kind of ballpark, so it seemed logical to describe him as a younger version of that, only with a campervan & surfboard in tow! Somewhere along the line, I created Scott's two sidekicks, Penny and Red, who work with him on set to film the Campervan Bushman TV show. Penny's mother Sally is the director and dies in book 1. Penny is the romantic lead in the series, and I loved the idea of having Red being a scardey-cat character who loves to skulk about in search of clues. Needing a 'thorn-in-the-side' character, I introduced the pernickety Dorian, who always feels like he's having to babysit a young film crew. Red wandered off towards the path, but instead of following it to the beach, he took the turn towards the residential area nearby. He'd been told that Mr Bambury lived in Bambury Lodge which was just the other side of the woods. Not hard to find, Mr Musgrave had told him. And he was right. A signpost along the way pointed both to the Lodge itself and to the more recent housing estate, built on the land the Bambury family used to own. According to Mr Musgrave, Mr Bambury's grandparents had been in financial crisis and had to sell the land off. To Mr Bambury's dismay, the whole area was eventually developed and he'd found himself hemmed in by characterless box housing, despite his lobbying against it when he was a councillor. Red walked along the wooden fenceline that surrounded the Bambury Lodge grounds and came to a large sign saying PRIVATE PROPERTY – KEEP OUT! Clearly, Mr Bambury didn't like pesky visitors. Red walked along a little further, and at the end of the fenceline, where a short line of sharp arrow-topped railings began, he came to another warning sign that read BEWARE OF THE DOG! which featured a picture of a hungry Alsatian. Red frowned, wondering at the wisdom of his decision to snoop about. Back at the campsite, he'd been all full of determination to help Penny out, but now…? It wasn't as though he was some kind of streetwise private eye from a TV show who knew how to take care of himself if he got into a tight spot. Red's breathing tightened, sure his childhood asthma was making a comeback. He was thinking that maybe he should just go back to the site and leave things to the police, when he saw a car driving towards the front gates of the property as they slowly opened. The car passed through and came to a stop. Red could see Mr Bambury sitting in the front seat. Just like his glasses, the windows of his racing-green Jaguar were tinted, but the front windows were down. Mr Bambury checked the exit was clear and drove off. It was all the encouragement he needed. Bambury's taking his dog out for a walk, Red thought as he watched the car heading down the road. Gritting his determination, Red hurried along, just making it through the wrought-iron gates as they automatically swung shut. Instead of sticking to the tarmac driveway, he began creeping through the grounds as though he were on some kind of military operation. Clearly he'd seen too many movies. He knew from what Mr Musgrave had told him that Mr Bambury lived alone – no wife – at least not any more – no children, and no butler. Red moved through the swathe of pine trees surrounding the lodge, his heart beating fast as he ducked from tree to tree, crunching on pine needles, cones and twigs as he went. He stopped, held his breath, and stuck his head out from behind a tree, trying to get a good look at the lodge. It was an old, stone building covered in deep green Virginia creepers and fronted with numerous windows. At the side of the building was a large kennel, no doubt the home of Mr Bambury's beast of a dog. Thankfully, as he moved nearer to the building, Red could see no signs of life. The place looked peaceful, totally deserted. All the better to have a good nosey round, he thought. Although he hadn't quite worked out a plan of action yet. Was he going to try and break in? Or just see what he could see through the windows? He had a video facility on his camera, so if he spotted the camp stove, he could easily get footage – and then there'd be proof that the old nuisance was guilty. He'd have found Sally's killer. Just as Red was beginning to drop his guard, something hard hit the top of his back and startled him. He let out a sudden yelp, thinking someone had spotted him skulking about. But when he span round, he saw a fluffy grey tail bobbing off at speed along the pine ground covering. Thank God! Red thought, blowing out a sigh of relief. It's just a stupid squirrel! Great time to use me as a springboard, mate! Red's breathing tightened abruptly when he heard the bark of a dog. Oh, no! he thought, his head swivelling back around towards the lodge. He's here after all. Alerted by his cry of surprise, Mr Bambury's dog had woken up from his slumber and his head was now sticking out of the kennel. Red's heart was thudding in his chest and he instinctively backed away, hoping he could hide behind a tree before the dog spotted him. But as he stepped back, a large twig snapped loudly under foot and the dog's head shot round. Red's eyes bulged with disbelief as the mutt suddenly ran in his direction.